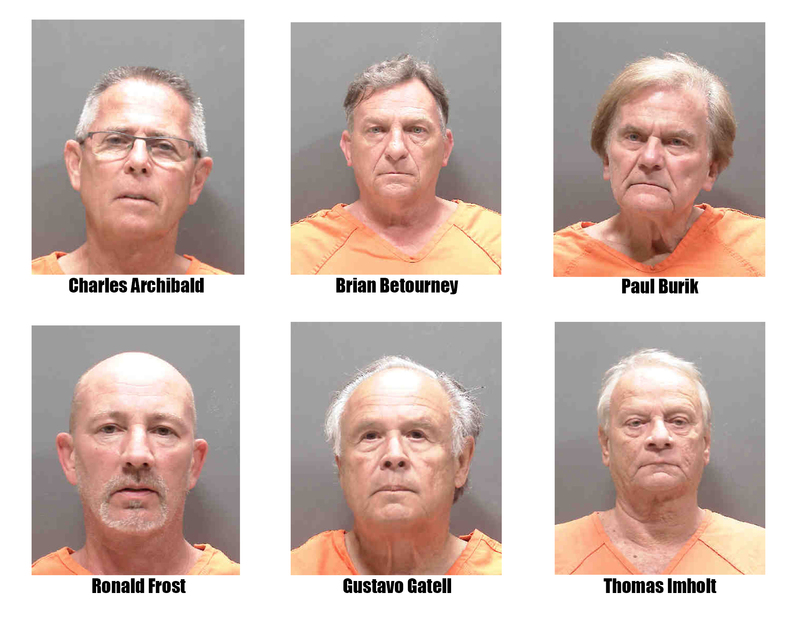 The Sarasota County Sheriff’s Office arrested six men, ranging in age from 51 to 77, for indecent exposure during an undercover investigation at Jelks Preserve and Caspersen Beach. Special Investigation Section detectives launched an investigation in late March after receiving information regarding lewd behavior occurring at a Sarasota County park. On March 27, undercover detectives monitoring the parks, picnic areas, and trails observed six men engaging in a variety of inappropriate conduct in public. In each instance, the suspects openly interacted with an undercover detective by exposing sexual organs or soliciting lewd behavior. Charles Archibald, DOB 10/13/57, of 12614 Lake Silver Avenue, Lakewood Ranch, is charged with Indecent Exposure. He was released March 28 on $500 bond. Brian Betourney, DOB 05/08/58, of 9039 Anita Avenue, Englewood, is charged with Indecent Exposure. He was released March 28 on $500 bond. Paul Burik, DOB 03/29/44, of 300 Tortuga Drive, Nokomis, is charged with Indecent Exposure and Resisting without Violence. He was released March 28 on $1,000 bond. Ronald Frost, DOB 11/30/67, of 329 Alligator Drive, Venice, is charged with Indecent Exposure. He was released March 28 on $500 bond. Gustavo Gatell, DOB 03/30/42, of 3983 Maceachen Blvd., Unit 435, Sarasota, is charged with Indecent Exposure. He was released March 27 on $500 bond. Thomas Imholt, DOB 07/08/50, of 841 Bayport Circle, Venice, charged with Indecent Exposure. He was released March 28 on $500 bond.